Well, +1 for creativity with the Koopa Troopas, but you should replace the rocks with something from DDP, because Clawgrip wasn't in that one in any form, and the spikes had a different, unanimated look. Otherwise it's game ready. I would change the Cobrats to Pokeys. Massive bump, but there are official SMW Blooper sprites. Funny. 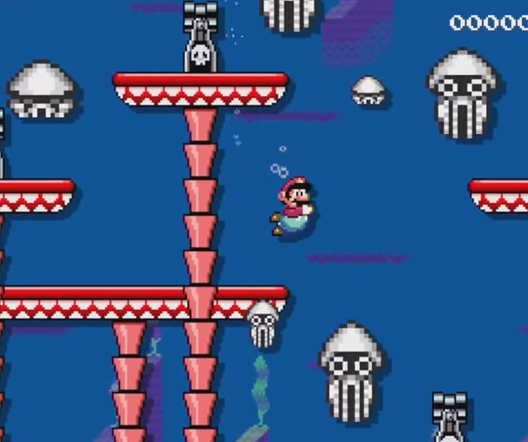 The design is similar to the SMB3 All-Stars one. Where are they found? I checked multiple sheets, and even the Cutting Room Floor. Are you sure that's official though? The size looks kinda...fucked. Like they were poorly scaled. When the Bloopers come out of the cannons, they stretch a bit before settling. Faruga and uglyrodent like this.